Recently, I stumbled upon the problem that the Activiti-engine wouldn't accept a BPMN-XML-file which I modeled with camunda Modeler. No error message or warning was displayed, but I could see in the log-file that parsing started. The process just didn't arrive in the repository. Because of that, I was wondering, how good the interoperability of the different engines and tools is at the moment. BPMN is standardised and should work on every tool and engine. But as usual, reality shows us, that it's different. This blog post covers several modelling tools and how good they work together. In a later blog post I'll feed the different BPMN-files to different engines. I chose the tools for no special reasons. Activiti and camunda because I work with Activiti (and camunda forked it). SemTalk because I do have a license for it (it's the only commercial tool I chose). The rest is more or less randomly in the list and because they are available for free. You can find my results in a PDF, which I placed here. grey -> it couldn't be tested or was unnecessary. Bizagi is completely grey, because it has no im- or export for BPMN-XML. I wanted the example process to be very simple. It includes the basics, which I think should be supported. It was modeled with every tool and opened with every tool. When testing if editing works, I added a task to the second pool. I don't want to name a winner, because I depends on what you're working on. Some modelling tools are embedded (like Activiti Modeler and Bonita) and some are standalone (like Yaoqiang) and there are different use-cases and environments in which you would prefer one or the other tool. But I got to admit, that I am a little bit disappointed by Activiti Modeler. It can't work with any of the the BPMN-files the other tools exported. Update: I added the results for Activiti Designer to the PDF. It works slightly better than the Modeler but could be better. I know that the Designer exists but I didn't know that it covers more features. I'll have a look at it and update my results. Thank you for the advice. sorry, I cannot help you with that question. Bizagi uses .bpm files but I don't know if you can interchange them with the tools you mentioned. 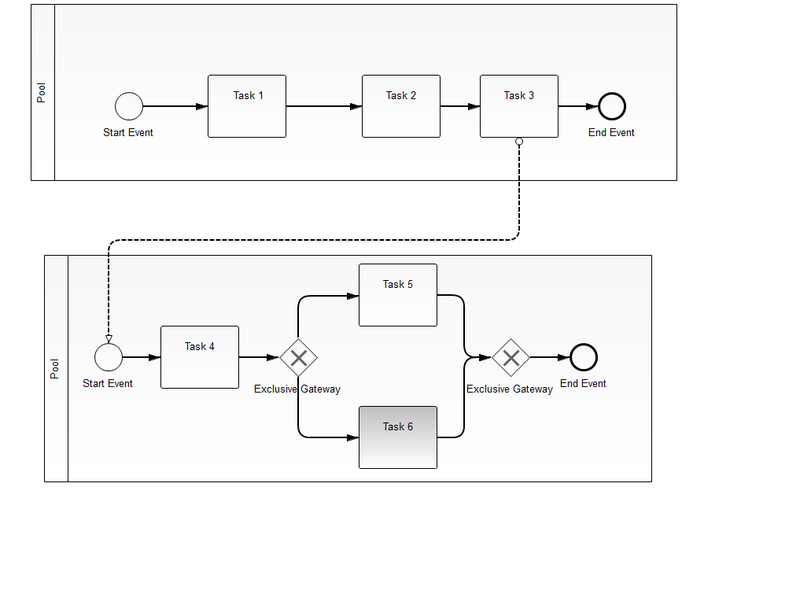 I'm beginner for BPMN diagrams and I see that you have many articles in this domaine, so I want to ask if you can help me to solve my problem and thanks so much. In fact, I'm using Powerdesigner for creating cdm and pdm diagrams and now I need to create BPMN diagrams. So I 'm looking for a tool that can exchange data with powerdesigner (export/import). Or if you can help me to have a vbscprit which can create or update a BPMN diagram into powerdesigner from an other tool, or an microsoft office (such as Excel, Visio). unfortunately, I have no experience with Powerdesigner. If their documentation does not mention any interchange, then there might be none. BPMN normally has a defined format, which is defined by the BPMN standard. There is even an OMG working group for that, see  and . Powerdesigner did not participate in the model interchange tests. Hi there, I'm trying to decipher your pdf! What do the different colors imply? for instance, When you import Bizagi XML into other systems, they are all marked as grey with no commencts. What do you mean by red, green, yellow and grey? and what do the attributes Open, edit and unwanted edits mean? Bizagi only allowed for an export into its own format, so no interaction with other tools was possible. "Open" meant you could open the BPMN file. "Edit" that you could open it and change some parts. "Unwanted edits" meant that the tool changed the diagram by itself. E.g. Bonita removed the pools from Yaoqiang, that counted as an unwanted edit.